Cushion cleaning recommendations provided by Paine's Patio. First, read Sunbrella's Official Cleaning Instructions. One of the best ways to keep Sunbrella® fabrics looking good and to delay deep or vigorous cleaning is to properly maintain the fabrics. This can be accomplished by simply brushing off dirt before it becomes embedded in the fabrics, wiping up spills as soon as they occur or spot cleaning soon after stains occur. If stain and/or mildew are severe, bleach quantities may be increased. See our stain chart for removal of specific stains. Sunbrella fabrics have a special finish that enhances water repellency. The finish is designed to last for several years of normal use, but may be refreshed after a thorough cleaning or extended use. Glen Raven recommends 303 High Tech Fabric Guard™ as the preferred re-treatment product for Sunbrella fabrics. 303 should be applied to Sunbrella fabrics after each thorough cleaning, which typically removes the original finish and reduces the fabric’s water repellency. In evaluating the services of a professional firm, you should inquire about the firm’s experience in working with Sunbrella fabrics and knowledge of cleaning and re-treatment requirements. DO NOT dry clean Sunbrella fabrics. Protect the area around your Sunbrella fabric when using a bleach solution – bleach may discolor non-Sunbrella fabrics. Always rinse Sunbrella thoroughly to completely remove bleach. Sunbrella fabric air-dries very quickly. Machine drying is not necessary. If fabric has some wrinkling, use an iron, if necessary, but only on the synthetic* setting. As some irons exceed the recommended 100°F/38°C temperature on the synthetic setting, test a small inconspicuous area before ironing entire piece. DO NOT use a steamer or iron set to steam setting. *Synthetic fabric heat settings normally do not exceed 150°F/66°C. 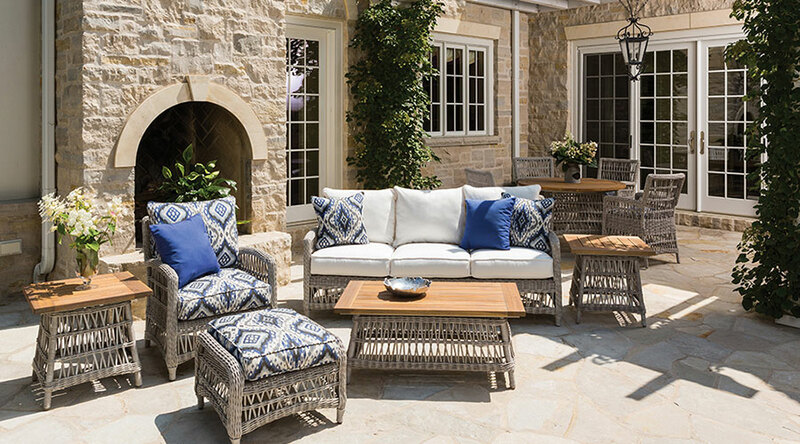 Learn more on how to protect your cushions from Mildew. Copyright ©2019 Paine's Patio, Inc. All Rights Reserved. Site Produced by Coastal Mountain Creative.